Located in the Kurdistan Province in Iran, Bidjar is a small, yet bustling city of roughly 52,000 residents. It is often referred to as the Roof of Iran, boasting an elevation of over 1900 meters (6,000 feet), and is well-known internationally as a center for graceful and historical contributions to the Oriental rug market. Though the city is part of Iran, there are great numbers of citizens who consider themselves part of the Bidjari culture and namesake. Stretching into areas of northern Iraq, and occupying parts of Syria and Turkey, lays the Kurdistan region, having a heritage that can be traced back several millennia. Today, however, most of the Persian rugs that are being produced come primarily from the city itself, owing a considerable portion of its economic sustainability to the weaving practice. 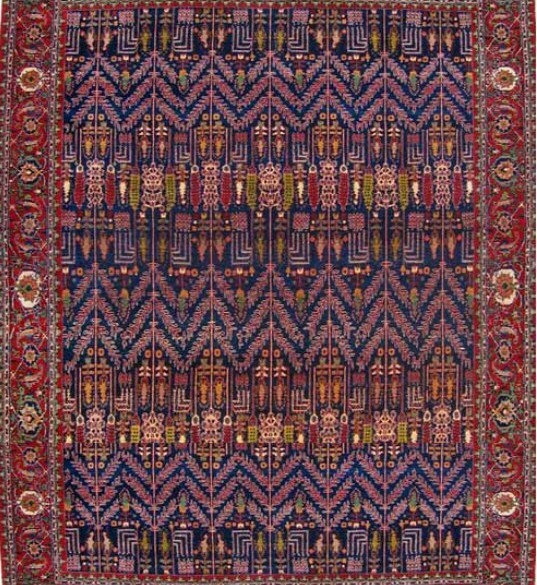 The Bidjar rug has, in recent times, been mostly sought after by American and other collectors in the Western cultures. Yet, for the past several hundred years, it has been widely popular among Persian and Asiatic nobility, often being commissioned by some of the more influential leaders in the region’s history. This has resulted in a great amount of pride among the Bidjari people concerning the rug weaving craft, evident in their devoted passing of the art on to subsequent generations. While there have been noted differences in the structure of antique and modern Bidjar rugs, their elegance has remained unchanged. Once called the “Iron Rug of Persia”, the name has served as a reminder to owners of its dense and finely-constructed craftsmanship, adding to its charismatic distinction as a “man’s rug”. 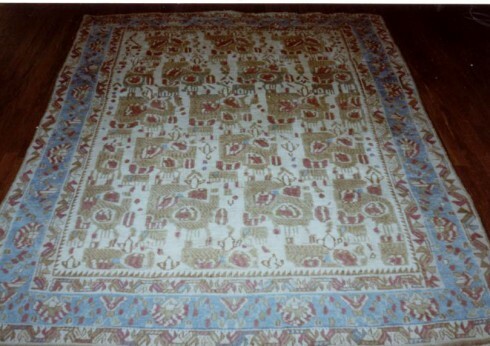 It has been said of these rugs that its pile is so expertly and densely knotted so as to make it difficult to lie down immediately after production. Nevertheless, this has attributed to fibers being constantly erect, and providing a uniquely cushioned feel when walked upon. Renowned for their marvelous artistry, Bidjar rugs utilize only the most excellent of materials in their foundations and threads. They are commonly composed of two wefts, the first being substantially thicker than the second, which is inserted by dampening the wool (or cotton) and compressing it into the rug through laborious tamping. The colored threads are then woven into the foundation using symmetrical Turkish, or Ghiordes, knotting – thus creating a signature experience for owners of the highly durable and striking rug. A unique characteristic of the Bidjar carpet is its utilization of bold color palettes that frequently feature only small variations in their selection, instead employing subtle tonal changes within a single hue. As a result, the coloration has been viewed as complimentary to rooms and hallways highlighting more understated décor, often falling into the red, blue and beige shades. The designs of the Bidjar rug represent the Kurdish influence in the practice, displaying conventional geometric and floral motifs, and sometimes embellished by fanciful medallion patterns. These slight nuances have helped the Oriental rug retain its presence as one of the most sought after by collectors in the industry.